Find and compare the best prices from a range of well known car rental companies at Mitilini (Mytilini) - Lesvos Airport. This is a free to use facility, enabeling you to book direct with the company quoting the price. 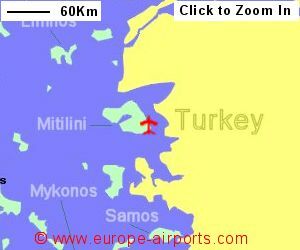 Mitilini (Mytilini) - Lesvos Airport, otherwise known as Odysseas Elytis Airport, is located 6Km south east of Mitilini, on the south east coast of the Aegean island of Lesvos, eastern Greece. A bus service is available into Mitilini costing approximately 1.50 Euros. 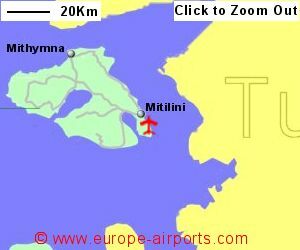 Mitilini (also spelt Mytilini or Mytilene) airport has a cafe/restaurant and 2 shops. 436,000 passengers passed through Mililini airport in 2017, an increase of 6% from the previous year.